Believe it or not, Americans were making Indian-style curries at the turn of the last century. We test-drove a recipe to find out what they might have tasted like. Welcome to “Eating History,” a series in which Jaya Saxena of the New-York Historical Society mines the vast archives of the museum and library in search of vintage images and ephemera that offer a look into how New Yorkers used to dine. Follow the museum @NYHistory for more. If you live in America, chances are good that you’re very cold right now, and nothing is better on a cold day than a hearty stew. Stews are one of those dishes that span countries and cultures—from a French beef bourguignon, to a Moroccan tagine, to South Asian curries. So this recipe for a hot, coconut-y curry seemed to be a perfect fit for an early January menu. Except it’s from 1894. 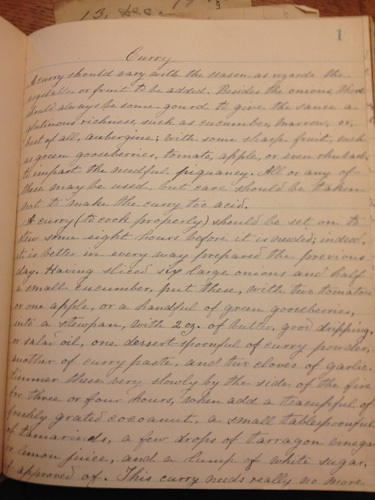 I was honestly surprised to see this as the first recipe listed in the personal cookbook of Isabella Vache Cox (who also gave us the Scripture Cake), which can be found in the New-York Historical Society’s Manuscript collection. I was even more surprised that it calls for ingredients like coconut, tamarind, and curry powder. There is a modern foodie assumption that appreciation for “exotic” cuisines did not begin until relatively recently, and that our American ancestors were just eating steak and potatoes until the 1970s. This cookbook suggests a different story. There is a modern foodie assumption that appreciation for “exotic” cuisines did not begin until relatively recently. According to The Cox Family in America, Isabella’s father was a mercantile broker, which may hint at how she came to access these exotic ingredients. Or perhaps they were just more commonplace than I would have assumed in the 19th century. [pullquote]A curry (to cook properly) should be set on to stew some eight hours before it’s needed; indeed it is better in every way prepared the previous day. 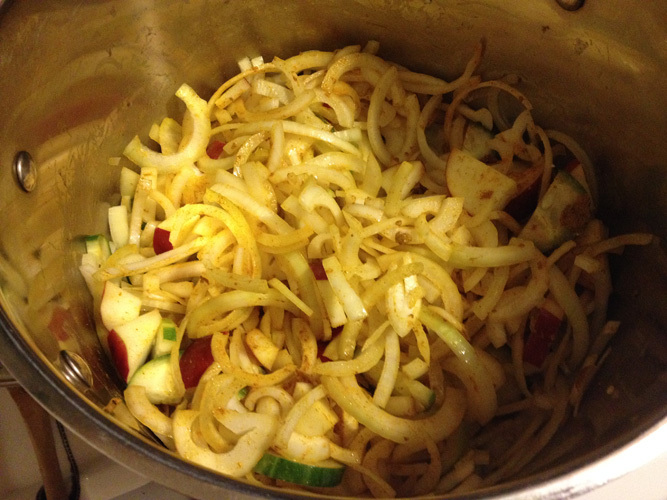 Having sliced six large onions and half a small cucumber, but these with two tomatoes or one apple or a handful of gooseberries into a stewpan, with 2oz of butter, good dripping or salad oil, one dessert-spoonful [two teaspoons] of curry powder and another of curry paste, and two cloves of garlic. Simmer for three or four hours, then add a teacupful of freshly grated coconut and a small tablespoonful of tamarind, a few drops of tarragon vinegar or lemon juice, and a lump of white sugar. 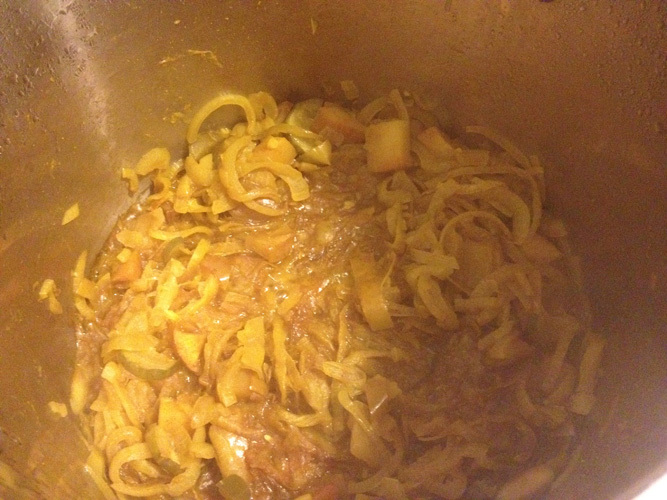 This curry really needs no more. If it needs it, add coconut milk or regular milk. 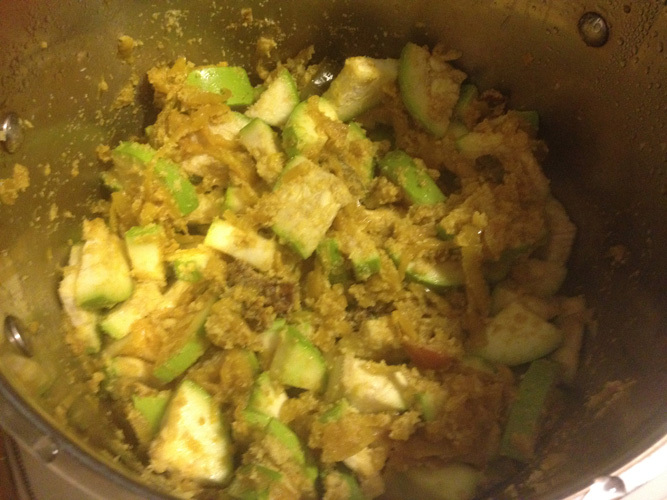 Curry powder is normally banned from my kitchen unless I’m making chicken salad, and I never make chicken salad. But I made an exception here, instead of using a fresher garam masala, for the sake of historical accuracy. 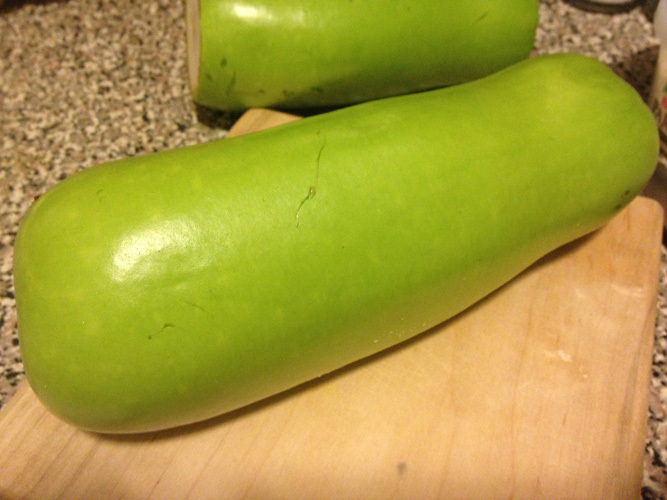 As for meat or vegetables, I could not find eggplant at my local grocery store, but I did find two Bottle Gourds (a.k.a., long melon/calabash), a common ingredient in South Indian cooking. Given the coconut-y flavors here, it seemed fitting, and it smells slightly of peanut butter when you cut into it, which is an added bonus. 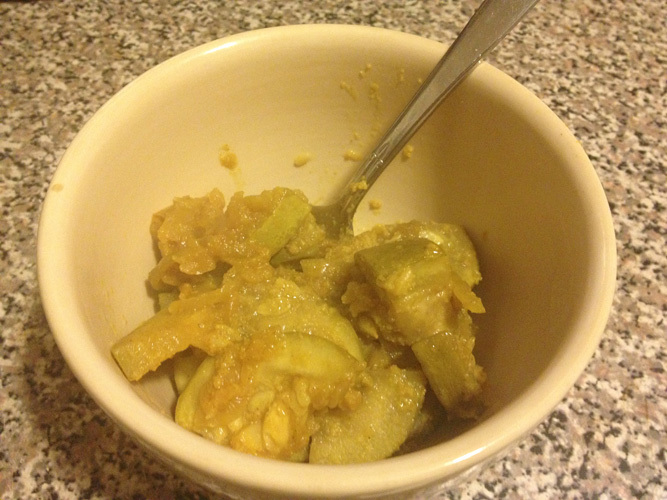 I also used an apple instead of tomatoes or gooseberries, and sunflower oil as the “salad oil,” which was just a generic term for any light vegetable oil you had lying around. 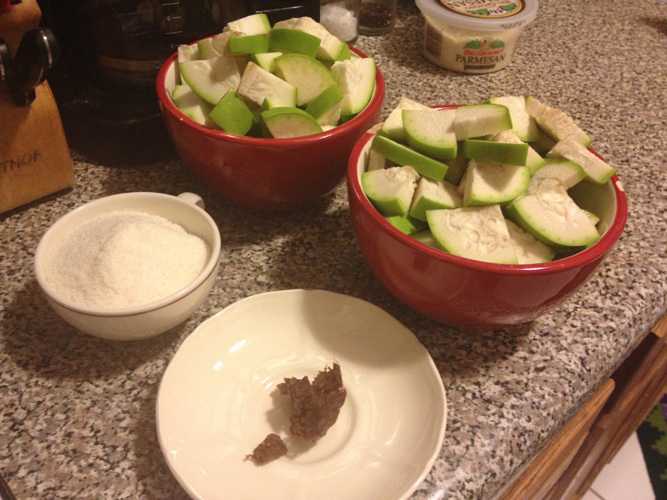 To my surprise, after five hours my kitchen smelled like heaven, and I had a moment wondering if 120 years ago this was the smell Cox impressed her neighbors with, as she explained to them just what a tamarind was in the first place. Sure, it could use some salt (I only realized at the end that salt and pepper were missing), and garam masala or panch phoran would be immensely more flavorful than a dull curry powder, but it was sweet and tangy and as tasty as your average Indian takeout. I’ll trust Isabella that it’ll be even better today.